I hear a lot about alignment lately. Business and church leaders like to talk about being aligned with mission, staffing, and consumers. It sounds great in meetings. It usually makes people think that you very smart when during any discussion you say “but we must make sure we have alignment here.” Try it next time you’re in any kind of strategy meeting, you’ll feel good. But true alignment is difficult to come by. The road to alignment is often paved with a lot of tough and very unpopular decisions—specially if you’re trying to re-align an organization that, for whatever reason, has gotten off course. Most likely, true alignment comes at the high cost of cancelled programs, product lines, reassigned or terminated staff positions. But when it works, it’s a beautiful and inspiring thing to see. I’m thankful to have been part of a true alignment exercise in the past year. During my first visit to Church of Brook Hills in Birmingham I knew I was walking into a completely different place it had been just a couple of years before. Their new Pastor, 29-year-old David Platt has a passion for world missions and social responsibility and it comes across every time he speaks. Brook Hills had been a great church since its beginning but David brought in a whole different vision than his predecessor. My team’s job was to help Brook Hills bring messaging alignment to David’s vision in the church’s overall communication strategy while Brook Hill’s leadership team worked on their system and program alignments simultaneously. There were no sacred cows: logo, brand statement, website, all and any church programming. One could argue that this alignment process is never truly finished but we have arrived at a point where visually Brook Hills’ story is being told intentionally at its most critical intersections. Brook Hills new logo features an stylized globe and the their three main core values: personal worship, local involvement, global outreach surround it. Their new brand statement: Impact The World, calls for action on both a local as well as global level. According the David’s vision, our calling is not only to reach our community but to reach, teach, and resource people worldwide. 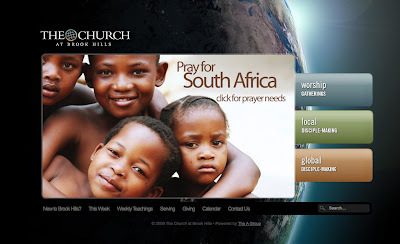 Brook Hills site’s landing page is a powerful reminder that we’re citizens of the world and the first thing on their rotating feature is a call to pray for a specific country. Every week you can click on the featured country and get stats so your prayers can be meaningful and strategic. I would encourage you to spend some time on their site and explore some of the strategic choices the church made online. Currently BH is working is working at translating David’s teaching series and small group resources in 10 languages of the world in order to resource pastors worldwide with free tools. 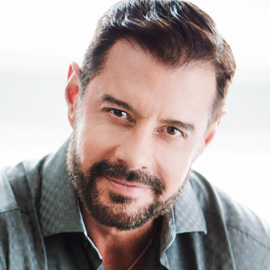 You don’t have to agree with David’s theology or even like him or Brook Hills, (I don’t see why you wouldn’t, however), but you cannot escape the heartbeat of this organization. Their story is being told on every screen, every letter, every service through a strategic and, yes, aligned effort. What about your organization or church? How long does it take for a newcomer to understand what you’re all about? Or even long time members? Great insight. I love David Platt's vision. Great post. Maurilio, your team did an exceptional job with the Brook Hills branding and website. Congratulations to you all. Fascinating story.Question: Was Brook Hills an older church with much to realign, or a newer plant, needing little change?Just wondering. I work for a church that's been around since 1965. We need refreshing. Keith,Brook Hills is about 18 years old. And after a couple of decades every church needs to make sure their image is not tired. I'm someone who uses the "alignment" word a lot in meetings. As the CIO of a global Christian broadcasting organization, I am constantly trying to achieve this with our systems, processes and when it comes to the web, our global brand position. Maurilio is right. It is difficult to achieve. I’m inspired and encouraged by the Brook Hills success story. I’ll keep pushing! The Brook Hills website is how I made my way to your blog. 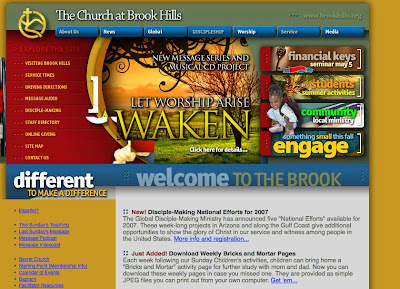 I'm doing some research for our church's website and I think the Brook Hills website is one of the best I've seen. It is very attractive and engaging. @Patricia, Thank you for the kind words. Let us know if we can help your church in any way.